I think that it is notable that Taser International is becoming so aggressive against all this bad publicity that they are suing medical examiners to force them to change reports that list tasering as a factor in people's deaths. 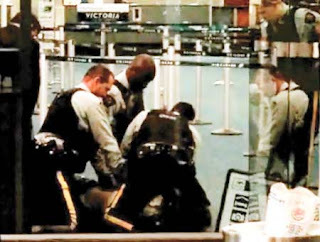 I thankyou for mentioning the taser murder by the RCMP (kanada's national thug squad) at the Vancouver International aiport. Video is on youtube. The visitor who spoke no english was in a secure area when the thugs arrived and 25 seconds later he was killed. It happened at 1:30 am. Airport is basically empty. It is interesting to read the misinformation the thugs have been disemenating in our local media. It was about 25 min. before medical help arrived, called by the killers. The person who shot the video tape had to threaten to sue before the tape was released back to him for public viewing. The murders would have kept it from the public if not for the tapers brave actions. 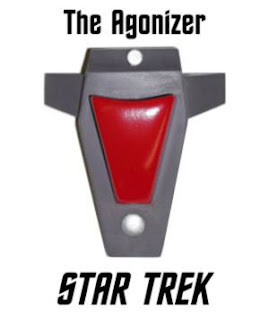 The taser is, also being used indiscriminately up here in kanada. How sad. After re-reading the account of your "dismissal" I will offer up imprecatory prayer for Mr. Benoit. David, as a man after God's own heart, would approve. Agape love was my recent study, I LIKE it! I hope the cowardly Benoit recovers and is able to find work suitable for him outside of the liberty movement. Although I have total disrespect for him as a man I am sure he is a loving father. I will pray that he comes to a knowledge of the Lord before it is eternaly to late for him. As far as the use of the taser is concerned it should be used only when life threatening force is justified both morally and legally. Police officers have the same right to self defense as all other citizens. In my view all people are endowed by our creator with the right to protect ourselves and our property. If that means we must use a taser or a shotgun so be it. In fact all citizens should be well armed to protect thensleves both from the everyday street thugs and the even more dangerous political powers working to destroy our liberty. We are fast approaching the time that armed agents of the Federal government will demand that we are disarmed. At that time Christian police officers must join the rest of the citizens and defend the Constitution even if it means turning their weapons on those who would disarm us. Of course it would be best if Americans would join the Ron Paul revolution and find others like him to replace the globalist traitors infesting the halls of government peacefully. Some of the regular writers on this Blog have been working towards this revolution for some time while others obviously don't have the moral courage or intellectual capacity to do anything more than spew forth their vitriolic venom. 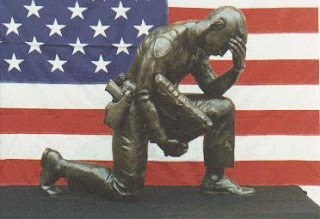 Although I represent the minority view on this Blog that their remain to this day many outstanding men in law enforcement who are oppossed to the escalating police state I know for certain that they are under pressure to leave because the system has indeed been corrupted. There is ample evidence as Will has consistantly exposed that a sea change has and continues to occur in the mindset of governmental policy makers. Law enforcement is changing form its original purpose of keepiong the peace and protecting innocent people to that of protecting the state tyrrants from the people. How many of you who complain about the growing police state and the abuses of its armed agents are going to buy a case of Will's new book to distribute in order to 'wake the town and tell the people'? The total for 2006 the feds have is 48 feloniously killed, 66 accidentally. There's no doubt there are some occupational hazards one must accept if he is to be a cop. But the odds are in his favor. The unpredictable variable is WHO he will run into in that dark alley. Parts of McNamara's opinion rings true. But the remainder don't cut it. Carrying a gun to defend yourself if it is likely you might need it requires serious attention. And if you are going to need a piece to save your miserable hide in a pinch you do not want to carry a .38 wheel gun. Why carry a gun that limits you to 6 bullets when you can carry a gun that holds 16? You're going to miss a few anyway when the pressure is on. Back then TWO handed shooting was a new thing! What if there's more than one bad guy? If you have to reload a six shooter under fire, cancel Christmas. If someone really needs to be shot to stop them from doing whatever they are doing, a pistol bullet is the least likely object fired from a gun to do the job. Pistols MIGHT help someone who is in a jam. McNamara mentions how many cops were killed when he was on the beat. Back then they were shooting38s with one hand under stress, with no body armor and probably with no flashlights, and at moving bad guys while the cop was standing still exactly as he was trained on the range (gun fights don't happen that way in real life). Add to this additional training oversights and you have more killed or injured cops. And that's not taking into consideration how many of the cops back then who were killed by someone they knew and/or were associated with because of an illicit relationship. Waiting to be shot at or stabbed before you take action- citizen or cop- is not the standard we should want. REASONABLE reaction to someone's actions should be the standard for all. I plan on buying a case of Will's books. Is it hot off the press yet? "With the dismissal of six product liability lawsuits during the quarter, Taser has had a total of 58 wrongful death or injury suits dropped, said Douglas Klint,"
Seems like Taser is having exceptionally good "luck" in the court system. When he was police chief of San Jose, CA, McNamara, your man of "integrity," was vehemently anti-gun and did everything he could to try and ban the possession of handguns by lowly private citizens. 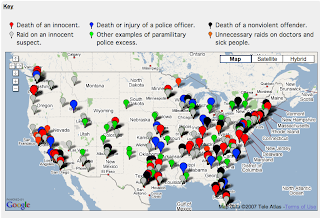 This year, so far, 168 cops have died in the line of duty. Some, are not gun shot wounds but vehicle accidents racing to some home where violence may be occuring or broken into. I guess to me is that the difference between the truck driver deaths and the others on Will's list and that of police and fireman is that the fireman and cops know the danger and run into the danger. By nature of the others jobs they know there is danger but are to avoid it. There is a lot of good things to praise in Will's article. Cops should be held to a higher standard. "Support your Local Police and Keep the Local"
Marty said: "I guess to me is that the difference between the truck driver deaths and the others on Will's list and that of police and fireman is that the fireman and cops know the danger and run into the danger." Cops run towards danger? You have to be kidding. The cops at Virginia Tech, for instance, waited outside in full body armor and behind trees until they had an army at the door, all the while unarmed and unarmored students were being shot every few seconds. They waited over five minutes by their own account; and according to other witnesses, the shootings actually began about ten minutes earlier than the police say. Those witnesses say people in the classrooms were calling 911 much earlier than the 911 logs the police have released apparently say they did. Cops routinely wait until all the violence is over before they don their janitor hats and clean up the mess left behind. Why are they paid so well if all they're going to do is act as if they are a cleanup crew? Cops are overpaid and have one of the safest occupations you can have -- not to mention one of the most secure. Don't depend on the police for your protection. Expect them to be late, expect them to screw up and shoot you rather than the perp, and expect them to slap each other on the back no matter what. I can't think of a better way to reform the police than to get rid of their overpaid, over-secure jobs. Abolish government police forces and instead allow individual neighborhoods to contract with security providers. I agree with the "support your local police" idea. Except I think that "local" should mean LOCAL. You should be able to walk to your security guard's office; and otherwise you should see him patrolling your neighborhood for you once every couple of days (or nights). I recently discovered your blog and your name was familiar to me. I formerly was a subscriber to TNA during the early to mid-1990s because of the influence of a local JBS member. Today is the first time I have learned of why you left TNA. The local JBS member, a man who is now approaching 80, also fell into the practice of morphing Mr. Bush into the newly-ordained fourth member of the Trinity (it is now a "Quadrinity," I suppose). I have not seen him since the eve of the 2004 election, when he expressed TOTAL puzzlement and exasperation as to why I was not bowing and scraping before Dear Leader as he was. It is amazing to see men who were totally devoted to the Constitution and individual liberties be transformed into advocates of tyranny by the bogus events of 9/11 et seq. How one can be so clear-headed in opposing drug prohibition, yet so misguided on the even more fundamental question of the right of individuals to armed self-defense, is a question I'm not competent to answer. There just had to be some logical reasoning behind his supposed opposition to the militarization of the police. And now it's quite clear ;). Well, he's all for the police losing their military arms and other implements they've managed to obtain from being partners with the DoD and DHS over the years. BUT only IF and WHEN civilians are completely disarmed, can he apparently be satisfied to see the police returning to their "measly" pistols and general 1960s era modus operandi. Why would you think this a paradox for a lifelong lawman, Will? I think your overly zealous opposition to the so-called "war on drugs" for some reason, Will, sometimes clouds your judgment of other issues. It makes perfect sense to me, given his background. Come now, you didn't really think McNamara, after all those years as a lawman, had rid his body and soul completely of a government-centric mindset? In some ways, McNamara and his ilk are more insidious than an open, above board "in your face" gun-control radical. He appears to be a citizen ally when in reality he's a police ally. No surpise there. From looking at the video stream at the Hoover Institute, the problem that all three debaters failed to mention or address, as with most issues these days, is the state of the culture itself having anything to do with the mishandling of guns and nefarious use thereof. Although, addressing the culture would have certainly diluted Lott's concise arguments more than those of the other two participants, unfortunately. Remember Will, this constitution of ours is only feasible and workable in a nation where the aggregate people possess a Christian-based moral foundation and they know right from wrong by themselves, take responsibility for their lives by themselves, i.e. can adequately self-govern, without any input required from an authority figure! We obviously no longer meet that criteria and the culture reflects that. William, excellent and well-written post...as usual! I recently resigned as a Canadian municipal peace officer after 5 years of futile attempts to help protect people from victimization. I worked in Canada's largest city, Toronto. I applaud your continued efforts to educate citizens on the true state of police affairs, as well as the true motivation of most police personnel. In particular, your identification of the police as "revenue generators" is stunningly accurate. It took me almost 5 years to accomplish the same level of "big-picture" understanding. It is easy for people to accuse the police of traffic ticket quotas and other revenue generation conspiracies, however the true extent of systemic traffic enforcement corruption is full and complete, analogous to a load-bearing beam rotten through and through. Most police officers are not intentional corrupt, however they stand by and refuse to stop the infestation of corruption from destroying the organization. This, while receiving an excellent salary, top-notch benefits, and a generous pension package. I can say with sincere happiness that I have begun the slow and deliberate process of cleansing myself of any and all remnants of indoctrination that I received. Retired NYPD and NYFD are the core talk radio angry white male Repuglican campaign workers.